Tüm eğitim alanlarında dijital materyallerin kullanılması oldukça popülerdir. Öğrenciler de bu alanlarda kullanılan dijital materyallerin etkili öğrenmeyi destekleme açısından faydalı olduğunu düşünmektedirler. Son zamanlarda bu materyallere, etkiyi artırmak amacıyla etkileşim özelliği eklenmektedir. Dijital materyallerdeki etkileşim, kullanılan materyal ile ilgili kullanıcıya kontrol şansı veren ve kullanıcıların bilişsel süreçlerini aktifleştirmelerine yardım eden bir bileşen olarak tanımlanmaktadır. Etkileşimli videolar ile ilgili çalışmalara bakıldığında, bu videoların, öğrenme ve ilgi çekme açısından etkileşimiz olanlara nazaran daha etkili olduğu görülmektedir. Bu çalışmada ise öğrencilerin dijital materyallerde kullanılan etkileşim türlerine yönelik bilişsel süreçlerinin ve deneyimlerinin incelenmesi amaçlanmıştır. Araştırmada, nitel araştırma yöntemlerinden durum çalışmasına yer verilmiştir. Araştırmanın çalışma grubunu, Atatürk Üniversitesi Tıp Fakültesi’nde öğrenim gören 36 öğrenci oluşturmaktadır. Araştırma sürecinde öğrencilerden, etkileşimli bir materyali kullanmaları istenmiş ve onlara materyaldeki etkileşim türleri ile ilgili etkileşim türlerini değerlendirme anketi uygulanmıştır. Ayrıca öğrencilerden bu etkileşim türlerinin kullanım ve faydalarına yönelik görüşler, sesli düşünme protokolü yardımıyla alınmıştır. Elde edilen anket sonuçları betimsel analize tabi tutulmuştur. Sesli düşünme protokolünden elde edilen veriler ise içerik analizine tabi tutulmuştur. Sonuç olarak; etkileşimli videolarda yer alan etkileşim türlerinin karar verme, akılda kalıcılığı sağlama konularında fayda sağladığı görülmüştür. Ayrıca videolarda en çok yönlendirme etkileşiminin beğenildiği ortaya çıkmıştır. Diyalog kurma etkileşiminin ise zihinsel süreçleri harekete geçirdiği için faydalı bulunduğu görülmüştür. The use of digital materials is very popular in educational areas. Students have also considered digital materials used in educational areas are useful in terms of supporting effective learning. Recently, interaction has been added to improve effect of these materials. Interaction in digital materials can be defined as an element that enables the learners to control the material used and helps to activate the cognitive processes. It is seen that interactive videos are effective about learning and engagement than videos in many studies. In this study, it is aimed to examine the experiences and cognitive processes of students about interaction types used in digital materials according to interaction types. Case study from qualitative research methods was used in this study. The sample of research consists of 36 students at Medical Faculty in Ataturk University. Students were asked to use interactive material during research process. Interaction Types Evaluation Questionnaire was conducted to evaluate interaction types. The experiences about usage and benefits of interaction types were also obtained from the students with the help of think-aloud protocol. The data obtained from questionnaire were subjected to descriptive analysis, the data obtained from the think-aloud protocol were subjected to content analysis. Consequently, it has been found that the interaction types in interactive materials are beneficial for decision making and remembrance. It is come out that navigating interaction type is liked by students mostly. Dialoguing interaction type has seemed to be beneficial for acting mental processes of students. Adair, J. (2000). Karar verme ve problem çözme. Çev. : Nurdan. Albanese, M. (2005). Coming to a medical school near you: full motion video medical education. Medical education, 39(11), 1081-1082. Bynum, A. B., Cranford, C. O., Irwin, C. A., & Denny, G. S. (2002). Participant satisfaction with a school telehealth education program using interactive compressed video delivery methods in rural Arkansas. Journal of School Health, 72(6), 235-242. Cardoso, A., & Santos, T. (2014). An interactive video to demonstrate the main features of the pendulum. Paper presented at the Remote Engineering and Virtual Instrumentation (REV), 2014 11th International Conference on. Chen, C.-M., & Wu, C.-H. (2015). Effects of different video lecture types on sustained attention, emotion, cognitive load, and learning performance. Computers & Education, 80, 108-121. Choi, E. (2014). Second Language Learning Through Drama: Practical Techniques and ApplicationsJoe Winston (Ed.). New York, NY: Routledge, 2012. TESOL Journal, 5(4), 792-795.
Cooper, J. B., Barron, D., Blum, R., Davison, J. K., Feinstein, D., Halasz, J., . . . Russell, R. (2000). Video teleconferencing with realistic simulation for medical education. Journal of clinical anesthesia, 12(3), 256-261. Coştu, B., Karataş, F. Ö., & Ayas, A. (2003). KAVRAM ÖĞRETİMİNDE ÇALIŞMA YAPRAKLARININ. 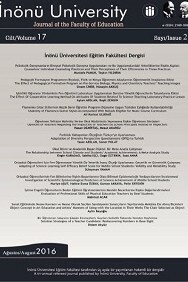 Pamukkale Üniversitesi Eğitim Fakültesi Dergisi, 14(14), 33-48. Çiçekoğlu, D. (2003). The effects of direct and integrated instruction of cognitive and metacognitive reading strategies at awareness-raising level on reading proficiency and strategy use. MIDDLE EAST TECHNICAL UNIVERSITY. Domagk, S., Schwartz, R. N., & Plass, J. L. (2010). Interactivity in multimedia learning: An integrated model. Computers in Human Behavior, 26(5), 1024-1033. Dominguez-Noriega, S., Agudo, J. E., & Santamaria, H. S. (2012). Supporting mobile learning through interactive video: ViMoLe. Paper presented at the Computers in Education (SIIE), 2012 International Symposium on. Ekiz, D. (2003). Eğitimde Araştırma Yöntem ve Metotlarına Giriş: Nitel. Nicel ve Eleştirel Kuram Metodolojileri, Anı Yayıncılık, Ankara. Fuentes, J., Bakare, M., Munir, K., Aguayo, P., Gaddour, N., & Öner, Ö. (2014). Autism spectrum disorder. Rey JM. Hughes, T. F., Flatt, J. D., Fu, B., Butters, M. A., Chang, C. C. H., & Ganguli, M. (2014). Interactive video gaming compared with health education in older adults with mild cognitive impairment: a feasibility study. International journal of geriatric psychiatry, 29(9), 890-898. Katz, M. L., Heaner, S., Reiter, P., van Putten, J., Murray, L., McDougle, L., . . . Slater, M. (2009). Development of an educational video to improve patient knowledge and communication with their healthcare providers about colorectal cancer screening. American Journal of Health Education, 40(4), 220-228. Kennedy, G. E. (2004). Promoting cognition in multimedia interactivity research. Journal of Interactive Learning Research, 15(1), 43. Kolås, L. (2015). Application of interactive videos in education. Paper presented at the Information Technology Based Higher Education and Training (ITHET), 2015 International Conference on. Korkmaz, B. (2010). Otizm: Klinik ve nörobiyolojik özellikleri, erken tanı, tedavi ve bazı güncel gelişmeler. Turkish Pediatrics Archive/Turk Pediatri Arsivi, 45. Lohrmann, D. K. (2011). Thinking of a change: health education for the 2020 generation. American Journal of Health Education, 42(5), 258-269. McMillan, J. H., & Schumacher, S. (2014). Research in education: Evidence-based inquiry: Pearson Higher Ed. Moreno, R., & Mayer, R. (2007). Interactive multimodal learning environments. Educational Psychology Review, 19(3), 309-326. Nelles, L. J., Smith, C. M., Lax, L. R., & Russell, L. (2011). Translating Face-to-Face Experiential Learning to Video for a Web-Based Communication Program. Canadian Journal for the Scholarship of Teaching and Learning, 2(1), 8. Ocak, G. (2004). İlköğretim okulu 5. sınıf öğrencilerinin okuma anlama düzeyine videonun etkisi. İlköğretim Online, 3(2). Petan, S., Mocofan, M., & Vasiu, R. (2014). Enhancing learning in massive open online courses through interactive video. Paper presented at the The International Scientific Conference eLearning and Software for Education. Rhoads, S., & Smith, B. (2012). Delta Interactive Solution to Collaborate Over Video for Education and Resources for Maternal Child Health. Journal of Obstetric, Gynecologic, & Neonatal Nursing, 41(s1), S60-S60. Schreiber, B. E., Fukuta, J., & Gordon, F. (2010). Live lecture versus video podcast in undergraduate medical education: A randomised controlled trial. BMC medical education, 10(1), 68. Schutz, L. E., & McNamara, E. A. (2011). Traumatic Brain Injury in K-12 Students II: Response to Instruction--When Will They Ever Learn? International Journal of Special Education, 26(1), 64-69. Schwan, S., & Riempp, R. (2004). The cognitive benefits of interactive videos: Learning to tie nautical knots. Learning and Instruction, 14(3), 293-305. Stewart, S. R., & Gonzalez, L. S. (2006). Instruction in professional issues using a cooperative learning, case study approach. Communication Disorders Quarterly, 27(3), 159-172. Taslibeyaz, E., Dursun, O. B., & Karaman, S. (2016). Interactive video usage on autism spectrum disorder training in medical education. Interactive Learning Environments, 1-10. Thistlethwaite, J. E., Davies, D., Ekeocha, S., Kidd, J. M., MacDougall, C., Matthews, P., . . . Clay, D. (2012). The effectiveness of case-based learning in health professional education. A BEME systematic review: BEME Guide No. 23. Medical teacher, 34(6), e421-e444. Van Someren, M. W., Barnard, Y. F., & Sandberg, J. A. (1994). The think aloud method: A practical guide to modelling cognitive processes (Vol. 2): Academic Press London. Yıldırım, A., & Şimşek, H. (2005). Sosyal Bilimlerde Nitel Araştırma Yöntemleri, Seçkin Yayıncılık, Ankara. ISBN, 975(02), 007. Zhang, D., Zhou, L., Briggs, R. O., & Nunamaker, J. F. (2006). Instructional video in e-learning: Assessing the impact of interactive video on learning effectiveness. Information & management, 43(1), 15-27.